The Eurozone is reinventing "Paneuropa". A leak within the ECB highlights significant divisions of opinion over expanding QE. German criticism shows how Draghi has undermined the Stability Pact principle of Eurozone membership. The limits of US-Eurozone divergence have become visible. Readers who are familiar with the semiotics of European heraldry may have noted the similarity between the photo-shopped image in the previous report, entitled "Projecting A Global Macroeconomic 'Transition Phase' Into The Geopolitical Void" and the latest flag of the Paneuropa movement. This article studies the latest stage of the creative destruction of the current version of the European Union and its rebirth from the ashes. The Phoenix in this rebirth increasingly resembles the imperial Eagle associated with European dynastic ambition to reinvent its imperial Roman origins. As the current Paneuropa movement is based in Munich, the home of previous political movements that have tried to control Europe, the symbolism is apposite. The last report, entitled "Draghi Should Know His Limits Rather Than Say He Has No Limit", suggested that Mario Draghi has lost his ability to weaken the Euro in addition to his credibility in financial markets. Governing Council member Ewald Nowotny contributed to the arduous task of rebuilding both of Draghi's core competencies. According to Nowontny, the massive rally in the Euro after Draghi's last press conference was a market failure. Perhaps the real failure is Nowotny's inability to comprehend the signal that the market was sending with the Euro rally. The market was saying that in its perception, the ECB has reached its limits of how much further it can weaken the Euro with more QE. Draghi comes from the pragmatic school of macroeconomists who were trained by Stanley Fischer at MIT. He no doubt understands this signal better than Nowotny. Draghi signalled this implicit understanding, when he dropped the wording "do whatever it takes" and took up the mantra "no limit", in reference to the tricks that he allegedly has up his sleeve. Draghi will however be required to do more than just talk, if he wishes to weaken the Euro further going forward. It is therefore time for him to clearly show and tell what "no limit" means. Governing Council member Erkki Liikanen then also tried to defuse market tensions. He diplomatically suggested that the ECB should be prepared to expand the latest expanded targets, only if the economic conditions demand such action. He also reported that there was a majority consensus in favour of a greater expansion, at the last Governing Council meeting, even though the final decision fell short of this view. Liikanen's words therefore confirm that there is a split within the ECB. He also confirms that there is no way that QE will get expanded, unless the inflation and growth picture deteriorates further. His position is only in favour of expanding QE further if a stronger consensus, based on the incoming data, can be achieved. Liikanen therefore clearly signalled that the limits to Mario Draghi's rhetorical "no limit" have been reached. These are not the words that Euro-bears would like to hear. Even Mario Draghi himself was compelled to add to the level of ECB rhetoric. He reiterated his commitment to do more and that there are "no limits" to what the ECB can do. Careful observers noted that, according to him, further action is conditional upon a further deterioration in growth and inflation. His reiteration was therefore lacking in the substance to significantly reverse the strengthening of the Euro. He then effectively undermined his whole "no limit" mantra, by saying that he confidently expects inflation to return to target levels under the stimulus from his new programme. This confirms that he has lost his touch, for weakening the currency. The existing tension within the ECB remains strong, as evinced by the comments of a new ECB entrant into the European wars of rhetoric. The Latvian central bank governor and ECB Governing Council member Ilmars Rimsevics opined that economic reforms must continue in tandem with fiscal austerity. In his opinion expanded QE provides a disincentive to invest for growth, by rewarding inactivity and preserving the unsustainable indebted status quo. His views seem to resonate strongly with those of the "Bundesbankers". The rather uncoordinated attempt by the ECB, to draw a line under Draghi's debacle, is in fact only raising suspicions that greater conspiracies within the institution are now being embarrassingly played out in the public domain. The credibility of the whole institution is now on the line. Yves Mersch became the latest would be conspirator to darken the institution's doors. According to Mersch there was a working committee that evaluated the proposal to boost the impact of QE by having a two tiered deposit system. It was then leaked that this proposal would be officially announced as policy at Draghi's next press conference. Consequently, speculators with access to this privileged information positioned themselves in advance of the alleged announcement. When no such announcement was made, an indignant violent unwinding of these speculative positions occurred. Mersch has therefore only served to draw attention to a smoking gun within the ECB. This smoking gun suggests that Draghi's "no limit" arsenal may include a two tiered deposit system. The smoking gun also suggests that there are those within the ECB who leak, in order to frame market expectations and hence put pressure on the Governing Council to deliver what has been leaked. There may also be those who disagree with the proposed new policies, who then use leaks to mobilize resistance against them. The resistance, to the two tier deposit proposal, was clearly evident in Germany. Sabine Lautenschlaeger's blunt public falling out with her ECB colleagues, over QE expansion, signalled what was to follow. Wolfgang Schaeuble followed Lautenschlaeger, by saying that Jean-Claude Juncker's plan for mutualisation of bank deposit risk is illegal. Clearly the Germans are totally unimpressed with the strategy to create a two tier deposit system that is then underwritten by the Eurozone tax payer. The reputation, for due process and best corporate governance practice at the ECB, has taken a severe knock. The institution has degenerated into a platform, through which differing factions fight for control of the monetary system and governing policy of the Eurozone, at a time when the pressure for it to split up has become extreme. The previous report, entitled "Projecting A Global Macroeconomic 'Transition Phase' Into Geopolitical Void", observed Jeroen Dijsselbloem's proposal for what was termed "Teutonic Europe" to replace the current degenerating system. The latest revelations of skulduggery, in the corridors of power at the ECB, provide further credibility to this the thesis of a "Teutonic Europe" alternative to the current status quo. Perhaps more worryingly from a global perspective, is what the current ECB in-fighting does to the perceptions of central banks in general. It was once accepted that politicians were dirty and independent central bankers were clean. The notion that independent central bankers had the people's best intentions at heart has been challenged by the impacts of QE. QE seems to have rewarded the wrong people. Germany's challenge to QE now risks painting central bankers who used QE ( ie most of the globally central banking community)as a an elitist cadre who are serving and saving themselves. The "Banksters" have become "Central Banksters". Whether this loss of faith in "Central Banksters" leads to their total loss of independence is currently moot. It does however give the politicians the upper hand. Most worryingly it probably means that Politicians and "Central Banksters" are viewed with equal disdain. Policy creation and execution therefore become much harder going forward, and markets will become less forgiving of perceived policy failures. This latest report also observed that Eurozone main street does not need QE, whilst also noting that the Eurozone and European Union were breaking up despite the apparent economic improvements. The latest Spanish housing data, which came out at the strongest level in eight years, underlines this observation. Spain is now going into national elections. Behavioural economists understand that respondents to a questionnaire often answer what they think that they have been asked. What they think they have been asked totally is different from the question in front of them in some cases. In France, the recent regional elections were viewed as a question of the government's handling of national immigration rather than regional governance. In Spain it is highly probable that the national elections will be viewed as a referendum on continued Eurozone membership by the majority of the electorate. Already the record of Prime Minister Rajoy is being analysed in this context. Looking dispassionately at the data, total debt levels are close to pre-crisis levels whilst the real economy has barely improved. 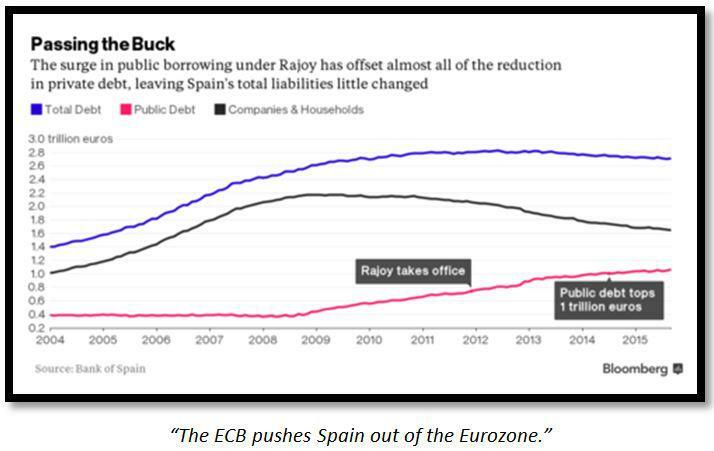 Over-leveraged Spaniards have deleveraged and new borrowers have remained on the side-lines. Asset prices and the fortunes of the minority of Spaniards, who are geared to them, are also back at pre-crisis levels. This is not an enviable record for a Prime Minister seeking re-election on the basis of continued Eurozone membership. More worryingly, the Spanish public debt level has mushroomed beyond levels that can be sustained by the anaemic economic growth rate. Spain is therefore pushing up against the Stability Pact limits on its continued membership of the Eurozone. This continued membership is sponsored and financed by the ECB's willingness to hold Spanish sovereign bonds at egregiously low levels of interest. In fact, at negative rates of interest, Spain is actually being paid to make its debt levels go beyond the Stability Pact red lines. The ECB itself is therefore contributing to the unsustainable situation in Spain and other similarly indebted nations. The ECB, which owns Spanish sovereign debt, must be getting very nervous. Presumably this is one reason why the ECB is so keen on mutualising the debts and deposits of Eurozone nations. The ECB is now facing a systemic failure which will translate into its own insolvency and forced liquidation. When a situation develops in which the ECB has contributed not only to a country breaking Stability Pact limits, but also in bringing its elected government into political crisis, it is reasonable to conclude that Mario Draghi has reached his limits. His assertion that the ECB has "no limit" is therefore baseless. Germany on the other hand, with trade and budget surpluses, is ready and able to foreclose on the ECB and the whole Eurozone by converting its debt claims on these counterparties into political equity. When faced with this recapitalization, some countries will no doubt walk away from the Eurozone, leaving those remaining in something similar to "Paneuropa". Jens Weidmann signalled that Germany is now turning its intentions and capabilities in this direction. He was unapologetic for the German current account surplus, which now stands at 8% of GDP. In fact he blamed this number on the falling oil price and the weakness of the Euro. 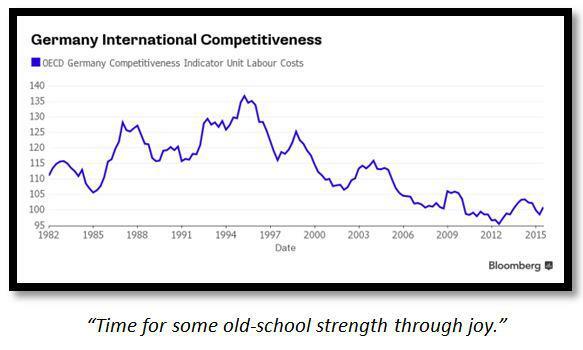 His analysis of these tailwinds is consistent with his Austrian School of economic teaching. Germany's surplus, in his opinion, is not as dangerous as other nations' reciprocal deficits. Germany is therefore not the problem. Indeed it is the solution, if only other Eurozone nations would follow its example of economic management. This decidedly unilateral view of a supposedly combined European problem, clearly illustrates Germany's perceptions. In short, it is all about them. Weidmann did not follow up his hint, that it is time to address the surplus issue, with an explanation of how this will be addressed. From his didactic conceptualization of the issue however, it is clear that other nations are expected to follow the German economic model slavishly. Weidmann also served notice that the Bundesbank wishes to set the limits of Mario Draghi's alleged "no limit" in relation to QE. 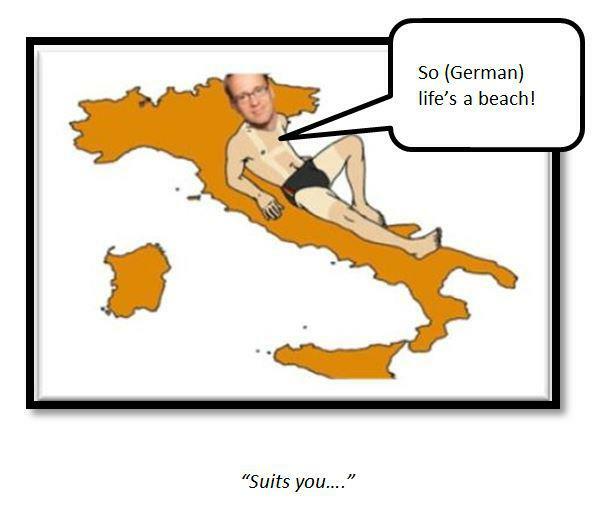 Weidmann emphasized that QE is creating the perverse incentives, for sovereign nations to continue borrowing without creating economic reforms, that are "verboten" in "Paneuropa". These perverse incentives have contributed to the trade and fiscal imbalances that have threated the existence of the Eurozone. If and when the nuclear option of Germany threatening to replace the Eurozone with "Teutonic Europe" exists, Mario Draghi will be blamed for its inevitability. 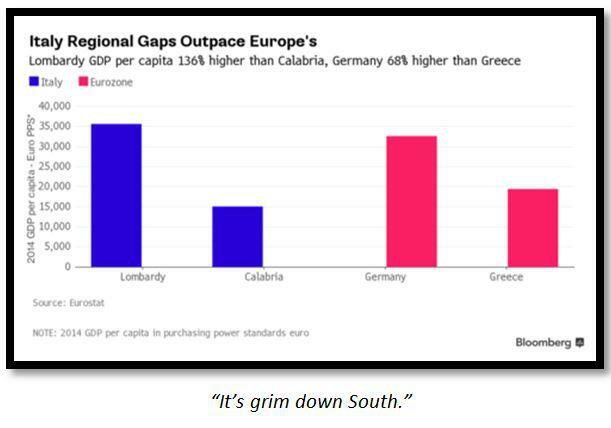 Moving to Italy, on the peripheral European economic and political tour, one finds that the gap between the North and the South of the country is actually wider than that between Germany and Greece. "Teutonic Europe" should now therefore be expanded into Lombardy to become "Paneuropa" as an economic and political core coalesces around sound German finances. Given the historic association between the Habsburgs and Spain, there is no reason why parts of Iberia are not subsumed into "Paneuropa", especially if the Catalans break away from Spain. The pressure from within Germany, to move in the "Paneuropean" direction, is more subtle but no less intense than that on the Eurozone periphery. 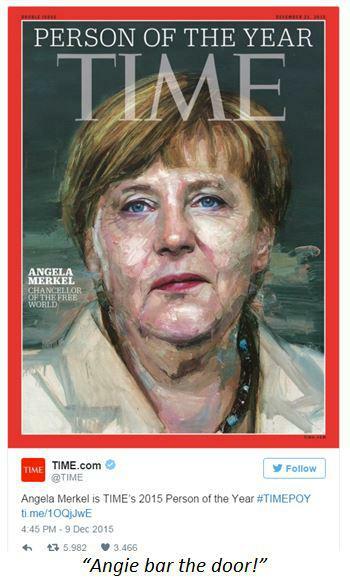 Merkel's award of Time's Person of 2015, pulled her in the direction of her "open door" immigration policy. This "open door" is not something that Germans are entirely happy with. There has therefore been an equal and opposite reaction from within Merkel's own CDU party to close the "open door", so that it remains politically representative and electable in 2017. A CDU convention came into force, with the expressed intentions and capabilities of closing the "open door". The immigration door effectively extends to the periphery of the "Paneuropean" zone's borders in Eastern and Southern Europe. Merkel's party will have to buy votes invariably to overcome the anti-immigrant sentiment. The cost for this is higher wages for the voters. 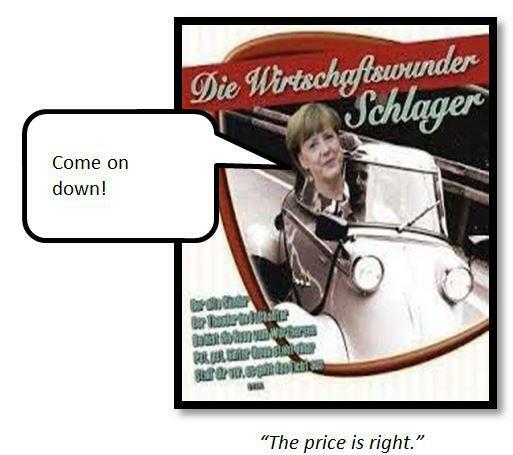 Germany's Wirtschaftswunder, which loosely translated means wages lagging inflation, will now end. This explains why the "Bundesbankers" are agitating for tighter monetary policy. Industrial Germany Inc. on the other hand is agitating for an influx of cheap immigrants, similarly to the Turkish diaspora which sustained the Wirtschaftswunder. In theory this will prevent the wage inflation, from the grand wage bargain with the anti-immigrant voters, eating into profit margins. The great spectacle of German political consensus formation, which has sustained the nation through the good times and the bad, has now taken priority over the nation's obligations to its EU neighbours. Neighbours who go with the German flow will become "Paneuropeans" - those who do not risk becoming tomorrow's Untermenschen. Merkel narrowly avoided a premature defeat, in her move to retain the leadership in 2017, when the elders in her party declined to hold a pre-convention convention to censure her "open door" attitude on immigration before the grand CDU party gathering. She did not however get off as lightly at the convention with Horst Seehofer, the Bavarian Premier and her host. He refused to back down and called for a cap on immigration. Merkel signalled that she has heard the message on immigration and wants to solve it from a joint European rather than unilateral perspective. As readers will now understand, "joint European" is code for "Paneuropean". Merkel is therefore turning with the "Paneuropean" tide of history. 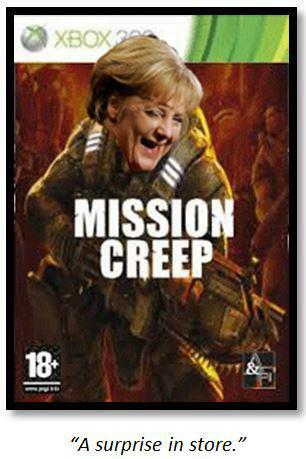 More ominously she hinted that this tide is washing towards deeper German military engagement "at the source" of the immigration problem in the Middle East. German intentions and capabilities "at the source" may not be what the coalition of the willing are expecting. The German intelligence services have clearly signalled that they view Saudi Arabia as a source of the problem and not the solution. "Paneuropean" strategy, in the Middle East, may therefore come as a total surprisewhen it is ultimately revealed. As Frederick the Great opined, it is pardonable to be defeated but never to be surprised. "Paneuropa" may therefore come as a total surprise that has not yet been factored into capital markets from a geopolitical perspective. The last reported suggested that France was stepping away from "Teutonic Europe" as the country turns right. The gains made by Nicolas Sarkozy, at the expense of both Hollande and Le Pen, does not signal a return to the "Teutonic" core of Europe despite the eponymous faux chemistry known as "Merkozy". 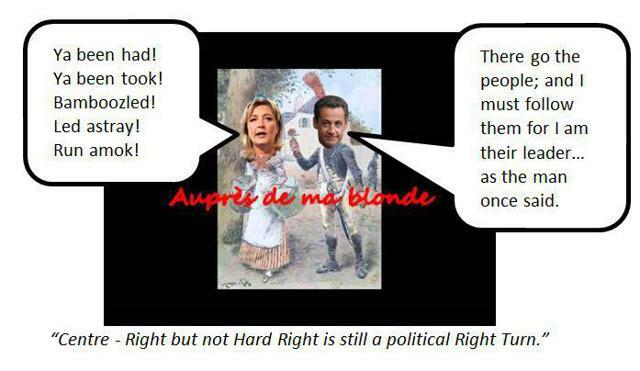 Sarkozy had a Ledru Rollin moment, in which he turned hard right in response to the signal from the French electorate. Basically he is now a follower rather than a leader of political opinion. The French people are sick of immigrants and equally as sick of "Teutonic" hegemony. Sarkozy now has to deliver on both issues, which immediately puts him in fundamental conflict with Merkel's "open door" on immigration and the closing door of "Teutonic Europe". The moves representing the political survival skills of Jean-Claude Juncker always provide key signals of how the European project is evolving. His latest comment suggests that he has taken note of the "Paneuropa" project and is trying to anticipate it. According to Juncker, the Eurozone cannot rely on Draghi's "no limit" and must press ahead with economic reform and capital investment of its own. Juncker also believes that the crisis is still in effect. Juncker has therefore noted the resistance to Draghi's expansion of QE, along with the innate fiscal reforms that the "Paneuropean" project demands. 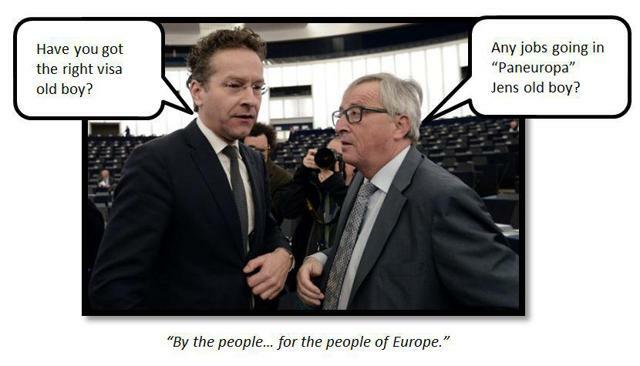 In relation to the raising of the "mini-Schengen" zone threat under Dijsselbloem's plan, Juncker embraced and then expanded it to the borders of his own bailiwick in the European Commission. Dijsselbloem's plan is far more democratic and representative than the European Commission governing body that Juncker heads. Acutely aware of this challenge from true democracy, Juncker changed his rhetoric to defend his technocratic arm of the Eurozone executive. According to him "these are all political decisions that require a political Commission that accounts for its actions before this Parliament". He then bowed down to the legitimacy of national democracies and opined that "the euro is a political project and that means it requires supervision ….. We need this Parliament as our strong partner during this". Even by his own verbose standards, Juncker was laying it on a bit thick. His words confirm the suspicion that "Paneuropa" has political legs, and that Juncker is trying to seek a role for the European Commission within it. Juncker still hasn't given up on his plan for the mutualisation of bank deposit insurance across the Eurozone however. After prostrating himself, at the foot of national sovereignty, he then proceeded to try and insert his plan for mutualisation into the deck. It is still a red line for Germany, so Juncker is taking a risky bet here. He hopes that he can sell his plan as part of the general political process to save the Euro currency. If bank deposits are not safe then neither is the Euro currency, applying Juncker's political logic. The next step in his logic is then to translate the bank deposit mutualisation into general debt mutualisation in a fiscal and political union. A "Paneuro", without Juncker's mutualisation by contrast, would force its members to stand behind the currency with economic reforms and fiscal prudence. The "Paneuro" currency would therefore be harder than the current Euro and most certainly harder than the Euro if Juncker's plans for mutualisation go through. The direction of the Euro from here therefore depends on whether it follows the "Paneuropean" route or Juncker's soft currency route. The FX market is currently undecided. Dijsselbloem responded to Juncker with an alacrity which fell well short of total support for his mutualisation plans. Whilst acknowledging, that deeper economic and fiscal integration was required, Dijsselbloem avoided tying this up by refusing to cede greater political authority to an un-elected European government policy making body like Juncker's current Commission. He opined that there is no need for "cynicism about the Euro". But he warned against too much optimism, making it clear that indebtedness was still an issue that needed to be resolved. Ominously, he warned that "there is no quick fix for this - it will take time". Clearly, Dijsselbloem is in no hurry to jump on Juncker's bandwagon, which suggests that he has plans of his own. His plans clearly envisage a reform of the Eurozone and its governance. Juncker's attempt at sneaking through his own plans, under the current governance status quo, was therefore dead on arrival. The belated moves by the EU, in response to Jeroen Dijsselbloem's plan for a mini-Schengen zone aka "Teutonic Europe", also signalled that the EU is taking the threat of "Paneuropa" very seriously. The EU has now raised the fences and tightened border controls to defend the existing Schengen zone. The previous report, entitled "Projecting A Global Macroeconomic 'Transition Phase' Into a Geopolitical Void" suggested that central banks going forward, would turn QE into a permanent expansion of the global money supply. In order to manage the asset bubbles that this will create, they will then tighten financial stability policy rather than monetary policy where appropriate to do so. The innate risk, with this strategy, was said to be the commercial banks' reaction to a tightening in financial stability. This would have a tendency to halt the creation of credit and also cut bank exposure to the lending market. This negative feedback loop was evident in the climb down of the Basel Committee, under intense pressure from the European banking lobby, from its proposed strategy to raise capital adequacy requirements for mortgage risk. The European housing bubble can therefore be expected to inflate significantly from here. The housing bubble may be joined by other lending bubbles, as the Basel Committee on Banking Supervision appears to be in full retreat from an invigorated banking sector. Credit Rating agencies, once the pariahs, are scheduled to make a comeback as the committee makes a U-Turn on its policy towards them under further pressure from the banking industry. No doubt the recently announced massive layoffs in the banking sector have convinced the Bank for International Settlements that the banking sector is in recession. Such a recession would lead to a collapse of credit and a return of depression like financial conditions. Evidently the BIS does not want to get the blame for this, so it is letting the banks off the hook. The BIS has been played, just as the Congress was played by Wall Street during the "Credit Crunch". It therefore looks as though normal business will resume shortly in the banking sector as it gets its hands on the permanent increase in the global money supply that the central banks have unloaded into the system. The previous report questioned Draghi's "no limit" rhetoric, in relation to his ability to weaken the Euro further by expanding QE. This has translated into real P&L limits for investors and speculators, who have gone short Euros/long US Dollars and then leveraged this up by going long European versus short US equities. Said investors are looking for the Fed to bail them out with interest rate increases, since the ECB can no longer be trusted. Can they trust the Fed however? And by the same token, can the Fed trust the ECB. The Fed is struggling to manage the growth in shadow banking. The Fed is primarily responsible for the flourishing of this sector, because of the "Zero Rate" policy combined with QE. Investors have sought yield and alpha in shadow banking. The Fed is not however mandated to oversee and regulate shadow banking, unless it is being done by Federal Reserve banking members. In addition, Mario Draghi is busy inflating a shadow banking bubble that American institutions are rushing to embrace. 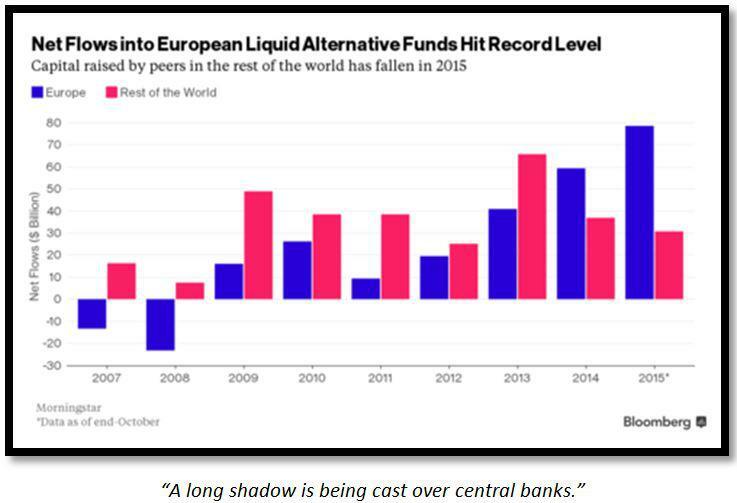 This European shadow banking bubble lies totally outside the Fed's mandate and core competence. It has significantly contributed to the weakening Euro versus the US Dollar and relative outperformance of European risk assets. Ultimately, the Fed may decide to use the blunt tool of interest rates to get its hands around the shadow banking sector. This would then play into the hands of those betting on continued divergence between Europe and the US. A tightening by the Fed may first however, have a disproportionately greater negative impact on European risk assets because their lofty valuations were achieved in part by leveraging up US Dollar borrowing. A strengthening US Dollar combined with higher US interest rates, will then hit European risk assets harder than US risk assets. The path of continued divergence, between European and US risk assets and their respective currencies, is therefore fraught with danger looking forward. The unanimous market consensus on a weakening Euro has now been broken.